New Zealand's Lake Taupo, touted by travel marketers as nature's ultimate playground, sits at the center of the North Island, about three and a half hours by car from Auckland, and four and a half hours from Wellington. The country's largest freshwater lake attracts water skiers, sailors, and kayakers, but fishing tops the list of favorite outdoor activities for many visitors. Lake Taupo covers 238 square miles (616 square kilometers), making it roughly the size of Singapore. It's the largest lake in the country and has nearly twice the surface area of Lake Te Anau on the South Island, New Zealand's next largest (133 square miles/344 square kilometers). It is much larger than the next biggest lake on the North Island, Lake Rotorua (31 square miles/79 square kilometers). Lake Taupo stretches 29 miles (46 kilometers) long by 21 miles (33 kilometers) wide, with 120 miles (193 kilometers) of shoreline. The maximum length is 29 miles (46 kilometers) and the maximum width is 21 miles (33 kilometers). The average depth is 360 feet (110 meters). The maximum depth is 610 feet (186 meters). Water volume is 14 cubic miles (59 cubic kilometers). Lake Taupo fills the caldera left by a massive volcanic eruption 26,500 years ago. In the past 26,000 years, 28 major eruptions have taken place, occurring between 50 and 5,000 years apart. The most recent eruption happened about 1,800 years ago. Taupo gets its name as the shortened version of its correct name, Taupo-nui-a-Tia. This translates from Maori as "the great cloak of Tia." It refers to an incident when the early Maori chief and explorer noticed some unusually colored cliffs along the shore of the lake that resembled his cloak. He named the cliffs "Taupo-nui-a-Tia," and the shortened form later became the name of both the lake and the town. Lake Taupo and the surrounding rivers make up the leading freshwater fishing destination in New Zealand. With the world's largest natural trout fishery in the town of Turangi, this is an internationally known trout-fishing destination; you can cast a fly in the lake itself and in surrounding rivers. The main species of fish are the brown trout and rainbow trout, introduced into the lake in 1887 and 1898 respectively. The rules of the fishery prevent you from buying fish caught there. You can ask a local restaurant to cook your catch for you, though. The forests and mountain areas around the lake offer many opportunities for hunting. Animals include wild pigs, goats, and deer. To fish or hunt near Taupo, you must purchase a fishing license or hunting permit. At the northern end of Lake Taupo, you can visit the township of Taupo (population 23,000) and find the lake's main outlet, the Waikato River. Interestingly, it takes about 10-and-a-half years from the time a drop of water enters the lake until it leaves through the Waikato River outlet. 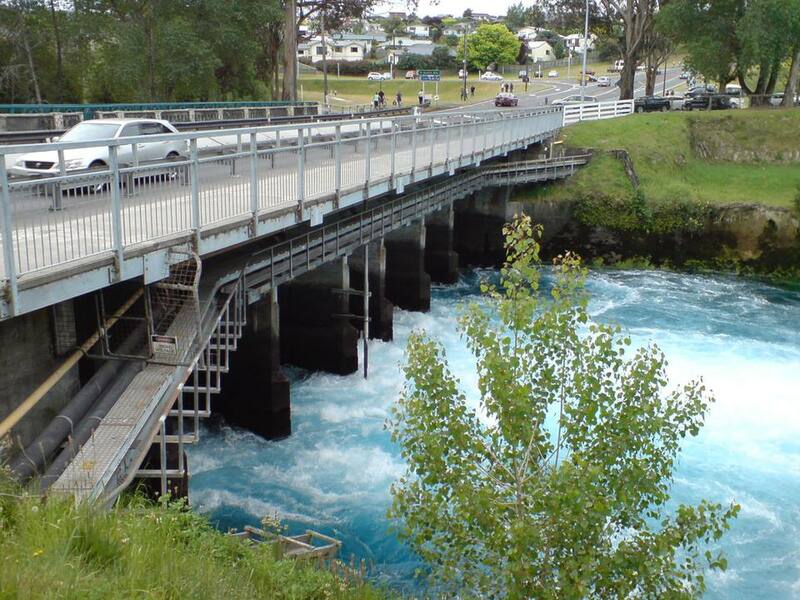 At the southern end is the township of Turangi, billed as the trout fishing capital of New Zealand. Farther south sits Tongariro National Park, one of three UNESCO World Heritage sites in New Zealand and the country's first national park. Mount Ruapehu, Mount Tongariro, and Mount Ngauruhoe dominate the skyline of the lake's southern end. You can see them clearly from Taupo township. To the west of the lake is Pureora Conservation Park, an important habitat for rare native birds.